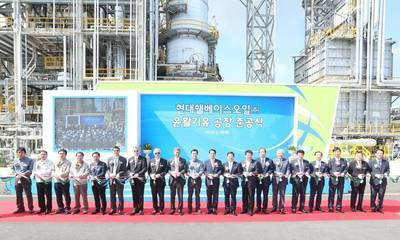 A joint venture company formed by Shell and Hyundai Oilbank, has inaugurated a new base oil manufacturing plant in Daesan, South Korea. The plant has the capacity to produce approximately 13,000 barrels per day or 650 kilotonnes of API Group II base oils per year. (Base oils are the key component of finished lubricants, making up on average of 60-80% of the end product). The plant was built to capture the growing demand for Group II base oils in Asia. Construction was completed in a record 20 months, close to 2 months ahead of schedule and successful commercial production of base oils began in July 2014. This is the fourth base oil production plant for Shell in the region, after Pulau Bukom in Singapore, Kaohsiung in Taiwan and Yokkaichi in Japan (a joint venture). Shell base oil production plants in Asia work alongside Shell’s network of 19 blending plants in the region, to deliver high quality Shell finished lubricants. Shell has blending plants in China, Singapore, Thailand, Malaysia, the Philippines, Vietnam, South Korea, Pakistan and India. Shell is also currently building two new blending plants in Asia, one in China and one in Indonesia. Shell Lubricants collectively refers to Shell Group companies engaged in the lubricants business. Shell sells a wide variety of lubricants to meet customer needs across a range of applications. These include consumer motoring, heavy-duty transport, mining, power generation and general engineering.